Growing chives in small pots in your home or outside in the herb garden allows you access to the mild, onionlike flavor when cooking. They resemble thick blades of hollow grass, with the blades often sliced thinly for use. Chives are a perennial plant and may grow year-round if kept indoors in a warm, sunny spot. Chives are often used raw as a garnish and seasoning, though they may also be cooked in certain recipes. 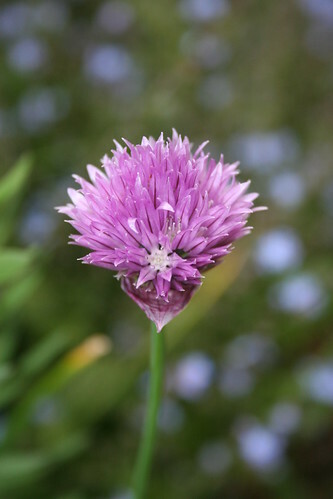 Caring for chive plants properly ensures they continue to grow well. Plant chives in a full-sun, well-drained garden bed or plant them in a pot placed in a sunny window. Avoid planting chives in areas prone to standing water. Water the potted chives when the soil surface begins to feel dry, providing water until the excess moisture drains from the bottom of the pot. Water garden chives once a week, providing about 1 inch of water each week. 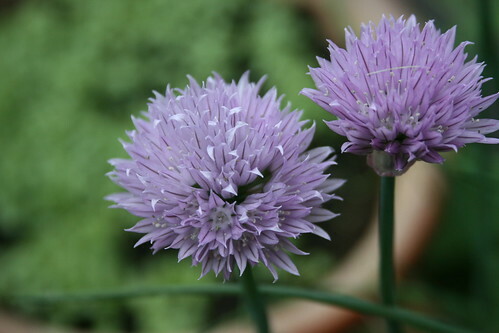 Cut off the purple flowers on the chive plants after blooming to prevent self-seeding. Use clean shears for pruning and harvesting. Removing old blooms also keeps the plants attractive. Harvest the chives as needed when they are actively growing and at least 6 inches tall. Cut off blades from the outside of the plant at ground level and use immediately or dry for later use. Divide chive clumps every two to three years. Dig up the clump and pull apart the bulbs. Replant the bulbs to the same depth they were at previously. Plant one bulb per pot or space bulbs 12 inches apart in the garden. Fertilize potted chives each spring with a soluble balanced fertilizer, following package instructions. Chives in the garden rarely need additional fertilizer.